It doesn’t amaze me so much when we’re driving down a winding back road in the hinterlands of Virginia that I can’t even find on a map and Bob Brown matter-of-factly says that just around the next bend, there’s a terrific little diner that serves the best breakfast (and outstanding pie at lunch). Or just over that hill coming up, on the right, next to a giant oak and across from a swinging bridge, there’s a pawn shop where he once found a great deal on a really old pocketknife. Bought it for $10 and later traded it for a small Harley. Or something like that. No, what amazes me is when we walk into these places and people know him. Brown and I have been gallivanting around the countryside – when we can get away with it – since I arrived at The News Leader 25 years ago. I like to tell people we discovered early on that we were a good match because we shared the same ambition: to stay out of the office as much as possible. The visual imagery of Brown and the verbal imagery of Lohmann. It doesn’t get much better than that. I actually talked with Bob Brown about this book — I believe it was when we were at the U.S. Senate debate at the Greenbriar in July 2014 — and how much I have always enjoyed his photos from around the Commonwealth. 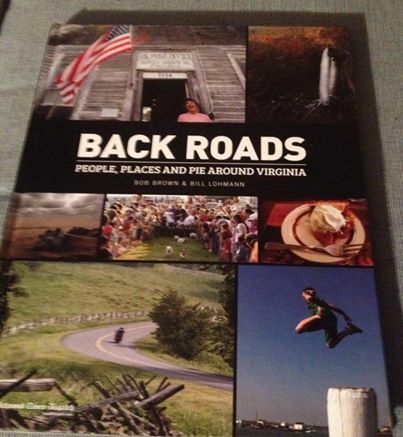 It is a delight to now have “Back Roads” to read and linger over the words and pictures. Now if I can catch up with these two and have them sign it….